Image caption Customers had to queue for up to an hour to get a single slice of pizza after a broken oven slowed the flow of food. Organisers of an all-you-can-eat pizza festival have apologised after repeatedly running out of pizza slices. Customers had to queue for up to an hour to get a single slice of pizza after an oven broke at the Notting Hill Pizza Festival on Saturday. Guests were promised "the opportunity to sample unlimited amounts of pizza" by organisers Bellmonte Life. The "high-end luxury lifestyle brand" blamed "overzealous appetites" as well as the broken oven for slow service. Image caption Tim Swabey said he waited 30 minutes for a pizza that "looked like something that had already passed through a cat's digestive system"
The firm said: "Despite the best efforts of our team preparing the pizzas in the smaller ovens, the flow of pizzas was slower than intended. "In contrast to claims that there were not enough pizzas, this was not the case. Our team was hard at work to ensure that everyone was able to sample pizzas. "However, it was unfortunate that the queues grew due to some overzealous appetites, preventing others to be able to enjoy the food." 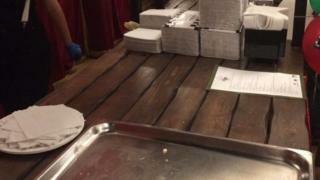 The event promised a "pizza for every palate" at the Porchester Hall, in west London. Alex White, 28, said she abandoned the festival to go to a pizza restaurant having only eaten two slices in one-and-a-half hours. "I'm definitely annoyed, it was clearly very badly thought through," said Ms White. Tim Swabey, 24, said: "When we arrived at the festival we were immediately surprised by the long queues for pizza at each stall. When pizza did arrive it "looked like something that had already passed through a cat's digestive system", Mr Swabey added. Festival-goers were given complimentary drinks when it became clear pizzas were not reaching everyone. Bellmonte Life has offered pizza festival ticket-holders complimentary VIP passes for an upcoming barbecue festival in July.